The European Hop, (part 1). There are a number of ways into extending ground hopping into the European arena. Some start off quite sanely. For example, if you plan a holiday or business trip into Europe, then why not go to a match near the town you are visiting. The next step in the sequence is to arrange the holiday (or if you can, the business trip), so as you are close to one or more football matches you may want to see. Some of my early trips involved starting a business trip a day early, or finishing a day late and getting a match in as well. In my early days, I had to be in France two weeks in a row for work. While my colleagues all headed off to family in the UK between these weeks, I stayed in France (aided and abetted by the company who let me keep the car hire at their cost, in lieu of the flight home) and picked up games on both days. Then there are the football tourists. The lure of the big sides in Europe, especially in Italy and Spain is such that tour companies are making a mint by packaging flights, hotels and match tickets together, while it does not take many more than two brain cells to work these through as separate items and book each one on-line. Most of the very big clubs have on-line booking facilities that are multi-lingual, although they too are not beyond adding a charge or two to sting the unsuspecting visitor. I have friends that do not call themselves groundhoppers, but make trips to Europe once or twice a season, picking on different clubs each time. I have even influenced them enough to pick on some of the lower division games to go with the “big stuff”, so a trip not only heads for Borussia Dortmund, but also takes in Wuppertal’s Zoostadion. But a holiday that is for football, and only football. That takes serious commitment. Generally, the key to the European tour is the Interrail ticket. This allows one to travel across the continent as much as you like. In the period towards the end of the season there are games somewhere everyday of the week, but in order to get to them, you need to spend vast amounts of time on the move, and these distances just cannot be achieved by road. As an added bonus, rail trips allow you to spend time sleeping, reading, or typing up internet blogs. While it is possible for things to go wrong when travelling by train. If the plans are too tightly timed, then a delay at some stage will mean missing a connection, but one may as well relax and simply work through the alternatives. FC Kray 3-2 SV Bergisch Gladback 09. Admission €8, no Programme. Hefeweizen €3, Bratwurst €2. First match on tour, flew to Charleroi with Ryanair, and then cut across to Essen by train. One of those odd journeys where time is saved due to delays to the trains, (I made a connection of minus three minutes at Liege). There are two S-Bahn Stations at Kray, which is just one stop from Essen, both Essen Kray Nord, and Essen Kray Sud are between 5 and 10 minute walk from the ground, but neither is blessed with a frequent service. 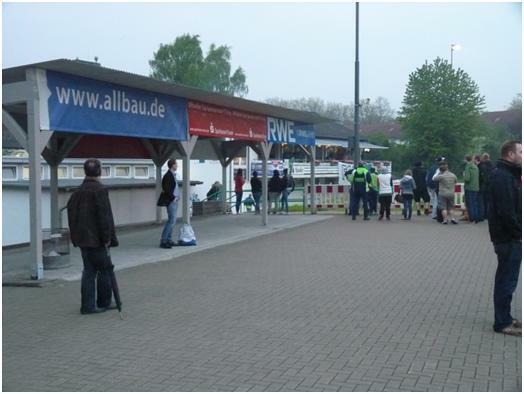 One alternatives is Steel Station, also a single stop from the Hauptbahnhof, from where I walked to the Stadium in just over 20 minutes, another is a bus service which runs along a reserved busway that makes up the central reservation on the motorway – I used this for the return. 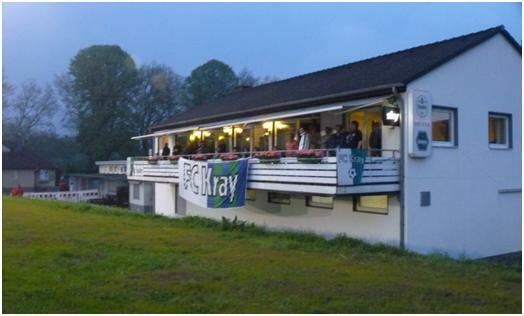 Until last season, Kray, (which appears to be pronounced Kry) was just another team in the suburbs outside Essen, and certainly not a distraction to the two established Essen sides, Rot-Weiss and Schwarz-Weiss (Red/White and Black/White for those who need to colourise their German). Both clubs have known better times, and now sit at the fourth and fifth levels of German football. 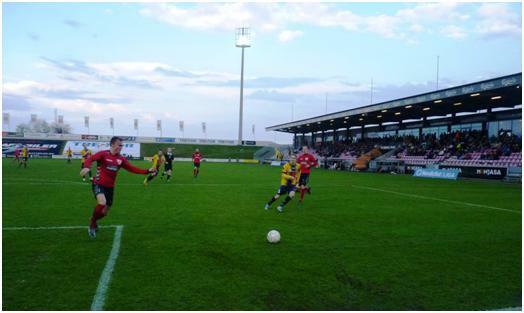 Kray however, managed to take advantage of the re-organisation at the end of last season, and winning a play-off against KFC Uerdingen (once Bayer Uerdingen in the top division), they leapfrogged over Schwarz-Weiss into the Regionalliga. 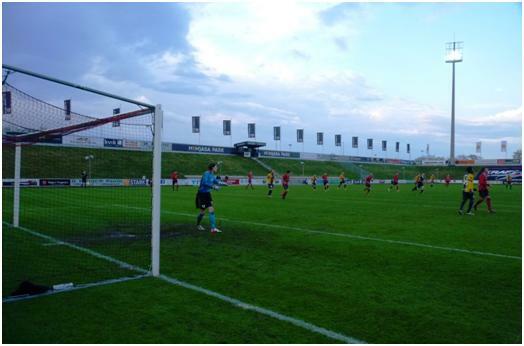 To rub salt into the wounds, the vital match was played at Schwarz-Weiss’ ground, as the Kray Arena is really not suited to crowds. The Kray Arena is now an artificial surface, very flat and in good condition, with three sides of paved terracing. This is all at pitch level, with no elevation at all. A new, still unopened “stand” sits opposite the clubhouse side, consisting of three or four high concrete steps, no signs yet as to whether or not this ends up as seating or standing, and if it will be covered. If it is seating, then as it is set well back, the views from the lowest row will be poor. This brings me to the covered standing – a large shed positioned near the entrance. It is at least ten yards back from the barrier, and still on flat paving. As no effort if made to stop people congregating under umbrellas, pitch side of this shed, it may provide shelter, but is useless as a viewing position for the match. Still, it rained heavily during the first half, and around 100 people were gathered within. Having left my umbrella in the hotel, I might have joined them, if I had not noticed the club house veranda. This is on the first floor of the clubhouse, but as the entrance is down some steps from the pitch, it is not raised much above pitch level. Again it is more than ten yards back from the barriers, but vitally it has awnings that keep the rain away. Each table here has a reserved notice on it, but one was free, so I placed myself close by. I needed to stand to get a reasonable view – but most of my neighbours were seated. The real advantage of this position was made clear after around ten minutes, when the barmaid made her rounds. It would have been rude to refuse, so I ordered a Hefeweizen, (with Alcohol) and this was delivered. The price was written on the edge of a beer mat, which I took to the bar at half time to pay, before watching the second half from outside. Within seconds of the start, it was 1-0 to the home side. The biggest surprise of the first half was this was the only goal, with the game being played at a fast pace, and both sides were creating chances. I was wondering if the game was too close to the game plans – as the ball tended to end up where it should end up, and most moves were ended by blocks, rather than tackles, loose passes or wide shots. Kray played an unusual formation, which I labelled as 3-3-3-1, three central backs, two wing backs (who rarely got forward, despite one of them scoring that early goal), and one shielding the backs as a defensive libero. The forward quartet were quite fluid, changing their positions frequently to confuse the markers. BG were in a more conventional 4-1-4-1 format. The goals finally came around the hour mark, Kray taking a two goal lead, only to have one pulled almost immediately. Five minutes later, a really good goal, placed over the advancing keeper re-asserted the two goal lead. BG pulled it back to 3-2 with a minute of standard time to play, but could not manage to level the game despite late chances, including their keeper heading upfield and heading narrowly wide from a corner. Simple two train journey (totalling seven hours) from Essen to Fredericia. The ground is just a 15 minute walk from the Station and you can see the four tall floodlight pylons from the station. The ground was built less than ten years ago, but it would not surprise me if its predecessor was at the same location. 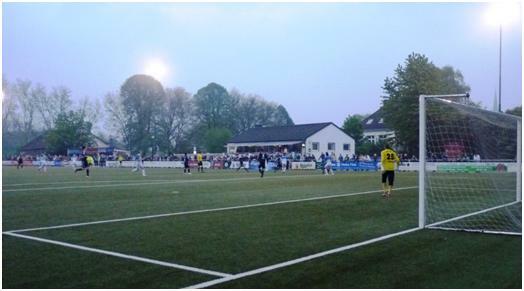 It now goes by the name of Monjasa Park, and the adverts for the company before the game, and at half time are in English, (I guess that way, all 554 spectators can understand it, if it was in Danish, then only 553 would have been able to). 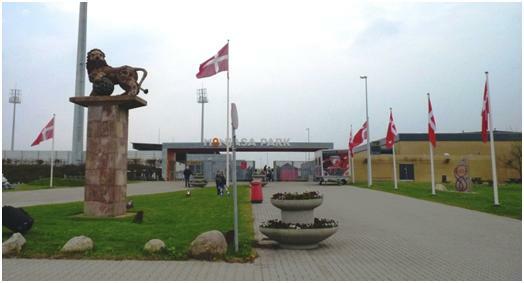 A map outside refers to the ground as Fredericia Stadion, and part of the Fredericia Sports Centre, comprising of a number of other facilities. Also adjacent are both the youth hostel and a Best Western Hotel, providing two different standards of accommodation. Not something I took up as instead I left by train soon after the game. Interesting ticket arrangements. One goes to the hut (on the right of the gates in the picture below), where you get a credit card style ticket. At the entrance gate, this ticket is then scanned, and then taken off you, so they are all re-usable. Almost all of the crowd are located in a single stand that runs the entire length of the pitch. Approximately 1400 covered seats in 8 rows, with the walkway at the back. The hospitality zone is behind this, but those enjoying this need to get outside to get a view of the pitch. For the rest of us, it is Bratwurst, quite pricy at 40 Kr (around £4.50), and coffee at 15 Kr. Beer is available as well. 80Kr to enter with a A4 size programme free. The areas to the end of the stand are stepped and could be used as terracing, but this is steep and without any barriers, so numbers must be limited. 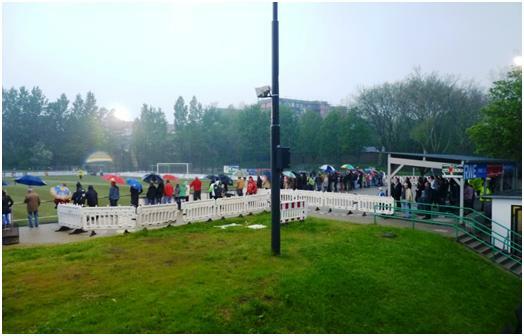 The rest of the ground is surrounded by a steep grass bank – too much to stand on, with a pathway at pitch level from which half a dozen souls decided to watch, at least once it stopped raining. There are two steps of concrete terracing opposite the main stand for a length of about 40 yards. It had been wet earlier in the day and there was also a heavy shower around kick off. The pitch looked good though, even though it was a slippery surface, and a couple of the home defenders delighted in the freedom to make long sliding attempts to get the ball generally when their success of failure had little effect on the game. It seemed to me that the visitors, Hobro had the better of early exchanges, but then Fredericia took advantage of a goalkeeping error and Christiansen slid in a goal on 17 minutes. They doubled this on 34 when Jakobsen was allowed to run unchallenged. Just before the break, Fredericia lost Mads Greve to a second yellow card. This allowed Hobro to reassert control as the second half started, with Justesen scoring on 57 and 63 minutes, the first when the home side struggled to clear efforts from the visiting number 99, Kebe, and the second a simple far post tap in following a cross from Fisker. Kebe then benefitted from a keeper’s error, an apparently simple save following a long shot by Thomsen, but it slipped out of the keepers hands into a perfect position for the Senegalese forward to score. Fredericia were still trying (and succeeding) in creating chances at the other end, it was just that Hobro were creating more. But just as I thought the game was swinging one way, it went the other – a break down the left and a cut back cross allowed Hagelskjaer to level at 3-3, and then Jakobsen having provided the cross for the equaliser breaks down the other side and scores to put Fredericia ahead. There were chances in both directions in the last ten minutes, but the tide had turned back in the home side’s favour and just before the whistle, Jakobsen finished the scoring, and completed his hat-trick with a fine solo goal. The result lifts Fredericia to 5th in the table, but they cannot go any higher, even if they win all their remaining matches, Hobro drop to 10th, four points above AB who are in the relegation place. This entry was posted on Thursday, May 9th, 2013 at 01:09 pm and is filed under The European Game. You can follow any responses to this entry through the RSS 2.0 feed. Both comments and pings are currently closed.